Compared to this time last year, median Eastside sales prices rose 9.1% to $960,000. The average cost per home square foot was $426. 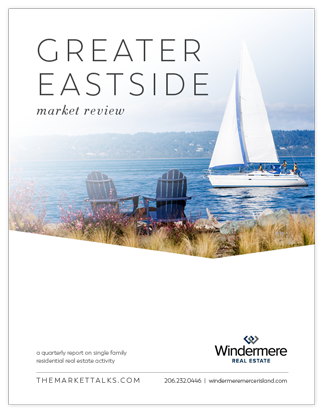 Kirkland was the leader on the Eastside drawing a median price gain of 30.6% over Q2 of last year. This was very loosely followed by Juanita/Woodinville at 14.4%, West Bellevue at 14.0%, and Redmond at 11.2%. South Eastside 7.5%, East Bellevue 7.4%, East of Lake Sammamish 6.9%, and Mercer Island 4.5%–all below the Eastside median–represented the fringe of Q2 appreciation.